Flinders Power announced on 1 February 2019 that it had agreed to sell the former power station site to CU-River Mining, an iron ore magnetite producer which plans to establish a port facility at the site. The site remains subject to an EPA licence and the EPA requires Flinders Power to fulfil all the actions and milestones in its closure plan before the licence can be surrendered. An application can be made to transfer the licence to another party, which would be required to comply with the licence conditions. Currently there has been no application to the EPA to transfer or surrender the licence for the Port Augusta power stations site. Although the licence has not yet been surrendered, it was revised on 27 March 2019 to remove activities which are no longer being undertaken on the site including abrasive blasting, fuel storage, desalination as well as crushing, grinding and milling. All closure obligations and rehabilitation requirements are still applicable and are outlined in the current licence. Power generating operations at the Port Augusta Power Stations site ceased on 9 May 2016.
removal of waste including appropriate disposal of asbestos. Flinders Power is required to meet specified actions, timeframes and milestones in regards to each of the above environmental considerations in its closure and post-closure plan. It is required to have and implement the dust management plan, as a condition of its EPA licence. Several dust events have occurred at this site since closure, including a significant event on 1 January 2017. Rehabilitating the site by covering it with topsoil and native vegetation, to provide a protective between ash and the community, is expected to reduce dust in the longer term as part of the Ash Dam rehabilitation plan. Application of topsoil and native seed across the site is ongoing. To address site contamination investigation and assessment, Flinders Power has entered into a voluntary site contamination assessment proposal (VSCAP) with the EPA and an independent accredited site contamination auditor is undertaking an audit of the site. Bird Lake is not part of the Flinders Power site and is not included in the remediation plan or EPA licence. On 20 March 2019, the Australian Senate Environment and Communications References Committee concluded its inquiry into the rehabilitation of mining resources and released its report titled Rehabilitation of mining and resources projects and power station ash dams as it relation to Commonwealth responsibilities. On 3 September 2018, the EPA appeared before the Australian Senate’s Environment and Communications References Committee in relation to its inquiry into the rehabilitation of mining and resources projects. The Port Augusta public hearing provided an opportunity for the EPA to outline our experiences in the rehabilitation of power station ash dams and the importance of having community health at the forefront of our minds when assessing the risks. Provision of national risk-based guidance for closures of this nature, potentially through the National Environment Protection Act 1994. Financial assurances should be a pre-requisite for all significant mines or facilities with substantial post closure responsibilities. Pre-closure planning and progressive rehabilitation should be a requirement for all facilities with significant post-closure responsibilities such as power stations. The need for early and upfront, face-to-face communication and engagement by the licensed company for the affected community. This timeline shows, following commencement of continuous monitoring, the contribution of dust events experienced in Port Augusta triggered by strong northerly winds, bringing regional dust in, as well as those from the south-southeast that include a contribution from the Power Station site. The majority of the ash dam is now covered in topsoil and seeded with native vegetation as part of the rehabilitation and revegetation plans for the site. Those plans can be viewed under Documents further down this page. Native seeds within the topsoil have begun to germinate and while vegetation is establishing, dust may continue to be an issue during periods of high southerly and southeasterly winds, which can carry dust in the direction of the township. During those times, Flinders Power is required to enact its Dust Management Plan to minimise the impact of dust on the community. Strong southeasterly winds in Port Augusta this morning are raising dust. In accordance with EPA requirements, Flinders Power has advised the EPA that it has activated its Dust Management Plan and reduced areas of observed dust lift at its site, including operating water carts and applying dust suppressant. The Bureau of Meteorology is predicting high winds will remain for the rest of the day. The EPA will continue to monitor the situation. The Bureau of Meterology has issued a severe weather warning. Damaging winds and dust can be expected across South Australia. Dusty conditions were experienced across South Australia due to seasonal northerly winds. The EPA monitoring equipment at Lea Memorial Oval detected high levels of dust with strong winds from a north-northwest wind direction indicating generally dusty conditions in the region. Flinders Power reported dust lifting off from the power station site. High winds were also experienced in Whyalla and Port Pirie with dust levels increasing. The EPA will continue to monitor the situation. Air quality monitoring stations at Lea Memorial Oval and Stirling North detected elevated dust levels peaking at 5 pm and remaining elevated until 9.30 pm. The Bureau of Meteorology reported winds of approximately 35 to 40 km/h from south to southeasterly direction, with gusts in excess of 50 km/hr. EPA staff were on site and able to make visual observations. Visual analysis of samples collected from filters within air quality monitoring stations indicates that this dust has a similar composition to dust from other directions. The EPA is reviewing the dust events of 12 March 2018 as part of its regulatory processes. Air quality monitoring stations at Lea Memorial and Stirling North detected elevated dust levels in the afternoon, peaking between 3 pm and 4 pm. The Bureau of Meteorology reported winds of approximately 44 km/h from south to southeasterly direction. Strong winds and high temperatures caused dust impacts in the Port Augusta region on Saturday 6 January. 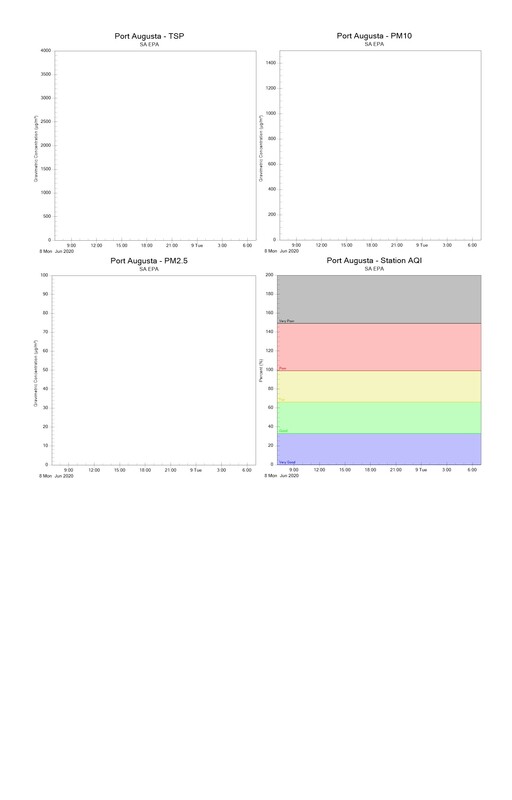 Air quality monitoring stations detected dust throughout the day, with northerly and westerly winds bringing dust from open areas north of the township. Topsoil on the ash dam at the former power stations site further contributed to elevated dust levels when a southerly change brought stronger winds late in the afternoon. Finders Power reported the front hit the ash dam at 4:58 pm and settled by 5:01 pm. Flinders Power operated sprinklers at the stockpile prior to the predicted conditions, and areas of the ash dam not covered by topsoil have been treated with dust suppressant. This graph shows hourly average dust levels and wind direction and wind speed at the Lea Memorial Oval monitoring station. Please note that the standard of 50 µm/m3 applies to 24-hour average data, not hourly, and should not be applied to this graph. Weather conditions in summer can cause significant dust in the Upper Spencer Gulf region, from both natural and built areas. Industrial sites licensed by the EPA, including the site of the former power stations in Port Augusta, are required to take reasonable and practicable steps to minimise dust impacts from their site on the community. The EPA received 9 calls to our 24-hour incident reporting line from the Port Augusta region on 27 December 2017. Samples of dust were collected from filters within air quality monitoring stations in Port Augusta, and sent to an independent laboratory for assessment. The results indicate that the majority of the dust contained soil and minerals, with some plant fragments and traces of dark particles. The report also determined that few of the dark particles (1–2%) could be identified as coal. This analysis is unable to determine whether any coal particles collected may be new (for example from the coal stockpile areas), or from a historical presence in the soil after so many decades of coal handling in the region. Long-term rehabilitation of the ash dam via topsoil and seeding requires detailed planning and takes time to complete, and as such a dust suppressant was applied to the surface of the ash dam as an interim dust control measure, which was considered the best option in the short term. The dust suppressant was applied to the surface of the ash dam by aerial spraying during November 2016 and observations indicated that this was controlling dust. Extreme and unforeseen weather conditions and heavy rainfall on 27 to 29 December 2016 caused pooling on the ash dam and polishing pond surface, which impacted the integrity and effectiveness of the dust suppressant. The EPA was notified of dust impacts on the township of Port Augusta by Flinders Power and directly by the community on 1 January 2017. Flinders Power immediately commenced reapplication of the suppressant. The EPA met with Flinders Power on 3 January 2017 and inspected the site on 4 January 2017 to ensure that all possible measures were taken to minimise the dust. An EPO was served by the EPA to secure compliance actions. The EPA has been liaising extensively with the Port Augusta community since the beginning of 2017, with individual phone calls, emails and meetings with residents in Port Augusta. Additionally, the EPA has provided regular updates to inform on the progress of activities. The EPA subsequently prepared a detailed report to summarise the response to the dust event. Status of required actions by Flinders Power to comply with the EPO. In response to the January 2017 dust event, the EPA required Flinders Power to undertake a Root Cause Analysis (RCA) to identify the primary cause of the dust event, its contributing factors and develop recommendations to reduce the likelihood and consequences of its reoccurrence. Flinders Power was required to review its Closure Plan and Dust Management Plan in light of the RCA and provide revised versions of the plans to the EPA. The RCA was reviewed and accepted by the EPA in February 2017. When any licensee ceases operations, the EPA must be satisfied that any potential environmental risks resulting from the site are managed prior to accepting a surrender of an EPA licence. Commonly this is managed through the requirement to prepare a Closure Plan which addresses all potential environmental risks, and actions to mitigate these. The EPA has a guideline for developing a Closure Plan. Since the announcement that the power stations would cease operation, the EPA has required Flinders Power to develop of a Closure and Post Closure Plan to address environmental issues, including the rehabilitation of the ash dam, via conditions of its EPA licence. Flinders Power's plan, provided to the EPA in 2016, details actions, timeframes and milestones for the management and rehabilitation of the site to minimise environmental harm. It considers the ash dam rehabilitation, surface water management, waste management including asbestos and scrap metal removal, removal of fuels, oils, lubricants and chemical substances from the site. It has been reviewed and updated by Flinders Power over time to take into account updated information and changes arising from current site activities. Revised versions are assessed by the EPA prior to approval. The most recent revised Closure and Post Closure Plan was approved by the EPA on 08 November 2017. The EPA often requires licensees via a condition of licence to develop a Dust Management Plan (DMP) to the satisfaction of the EPA to reduce the risk of off-site dust impacts. Flinders Power managed dust during operation in a variety of ways and has had a condition of licence requiring a Dust Management Plan since 1 January 2015. When the power stations were in operation, a seawater and ash slurry was pumped into the ash dam which proved successful in managing dust. The EPA received the first updated DMP from Flinders Powers on 1 April 2016, in light of the announcement of site closure. The EPA provided feedback on 15 April 2016, requiring that the DMP be amended to contain strategies to minimise dust post closure, including long-term dust management from the ash dam. The post-closure DMP included interim measures to maintain the crust by continuing to pump seawater onto the ash dam. The EPA inspected the site and wrote to Flinders Power on 31 August 2016, after receiving dust complaints via the Port Augusta City Council and the community directly. It was evident at this time that the interim use of seawater for dust control was proving ineffective and the EPA required that Flinders Power submit a revised DMP by 15 September 2016. A revised DMP was submitted to the EPA on 9 September 2016, and was conditionally approved subject to further prescribed amendments, including undertaking pro-active community engagement by 18 November 2016. The revised DMP also needed to incorporate changes to the Flinders Power air quality monitoring network required by the EPA. On 28 November 2016, the EPA was satisfied that the DMP satisfactorily addressed all EPA requirements and it was formally approved. Subsequent revised versions of the DMP are assessed by the EPA prior to approval. The DMP was revised as a result of the EPO issued to Flinders Power, and was approved by the EPA on 09 March 2017. The DMP was subsequently reviewed and revised by Flinders Power to ensure it was up to date in August 2017 and was re-approved by the EPA on 28 September 2017. The EPA requires Flinders Power to monitor air quality around the former power stations. The EPA mobile monitoring station was installed at Lea Memorial Oval, Port Augusta on 9 March 2017. This station is equipped to continuously monitor total suspended particulates (TSP), particles (PM10 and PM2.5) and meteorological conditions, as part of a short-term program to evaluate local air quality. Monitoring of PM10 and PM2.5 particles provides information to assess against health-based criteria. Flinders Power has also installed monitoring stations as required by the EPA to manage dust levels. 5 dust events since November 2017 when wind was blowing from SSE (from the former power station area). Most TSP originates with high wind speed (>40 km/hr). Regional dust (wind direction from north, northwest and northeast) and sea salt (wind direction from southwest) can also contribute to elevated dust levels. Frequent regional dust events during last 2 months (data displayed from 9 March 2017 to 16 September 2018). The national standard relates to PM10 averaged over a 24-hour period. 24-hour PM10 levels are similar to other locations in the region such as Whyalla and Port Pirie (9 March 2017 to 31 August 2018). There are regional dust events (wind direction from north) in Port Augusta–Whyalla–Port Pirie region that may contribute to elevated dust levels. Regional dust and sea salt (based on wind direction) also contribute to high PM10 levels at Port Augusta. 1 exceedence of 24-hour average PM2.5 (of 25 µg/m3) values in Port Augusta (9 March 2017 to 16 September 2018) due to a regional dust event on 2 August 2018). When the power stations closed and the ash dam dried out, dust from the ash dam became an issue. Extreme and unforeseen weather conditions and heavy rainfall on 27 to 29 December 2016 caused pooling on the ash dam and polishing pond surface, which impacted the integrity and effectiveness of the dust suppressant. The EPA was notified of dust impacts on Port Augusta by Flinders Power and directly by the community on 1 January 2017. Flinders Power immediately commenced reapplication of the suppressant. The dust was detected at Lea Memorial Oval and filters from air quality monitors contained particles from the ash dam (early January 2017). In order to prevent further impacts from ash in Port Augusta, it was important to cover the ash dams with soil. After the application of top soil the particles collected on air quality filters contain more red dust (from all wind directions). The polar plot presents 1-hour average concentrations of TSP and PM10 respectively as different colours, plotted against the direction from which the winds were blowing, centred on the monitoring station. Red areas indicate higher average concentrations, while blue areas show very low average concentrations. These colours are scaled and adjusted relative to the highest 1-hour concentration recorded during the monitoring period. The distance of the coloured area from the centre of the graph indicates how fast the wind was blowing on average, when the readings were recorded. So the centre point is 'dead calm'. Where 24-hour health-based standards apply, for example, in the case of PM10, these short-term averages do not provide direct information about potential health impacts on communities. This is best described in the graphs of daily averages. Rainfall in 2017 was generally lower in comparison with 2016 and mean rainfall for the Port Augusta area. Higher rainfall in late 2017 did not occur, which would have assisted establishment of vegetation in the ash dam. In the second half of 2016, the EPA installed its own air quality monitoring equipment adjacent to the ash dam to collect samples and to ascertain the composition of the dust. Samples of dust from the ash dam (from October 2016) were analysed, to confirm the elemental composition of the dust. The raw data received from the lab was used to convert to a concentration. Further mineralogy testing was conducted on dust samples and results were provided to SA Health for their assessment and advice. The report provides data on the mineral composition of the dust, from filter papers. The report provides data on the elemental composition (metals) of the airborne dust, which is reported in µg/m³ from the High Volume Sampler. Mineralogy composition of the filter paperThe report provides data on the mineral composition of the dust, from filter papers. Elemental composition of the filter paperThe report provides data on the elemental composition of the airborne dust sample, which is reported in µg/filter ie. this raw data requires conversion to provide a representation of the true levels of the elements in the airborne dust. This conversion is done by dividing concentrations by volume of air collected by the sampler. The EPA tested dust samples following claims that ash may contain asbestos. No asbestos was detected. The EPA treats all asbestos reports very seriously and acted immediately to confirm whether or not there was asbestos in the dust. Scanning electron microscope images of Flinders Power filters (Lea Memorial Oval, 1 January 2017). This output image from a Scanning Electron Microscope (SEM) shows dust particles collected on a high volume air sampler filter paper. The image confirms that dust particles on 1 Jan 2017 at Lea Memorial Oval were mixture of natural dust and particles from Flinders Power site (including ash dam). The image confirmed that there were no asbestos fibres present. The average dust levels over a one-hour (or 15-minute) period. An average of the hourly readings of dust levels over the previous 24-hour period. The previous 24 one-hour readings are averaged each hour. What does it say about air quality? It tells us about dust levels over the previous 15 minutes to 1-hour period. It tells us about air quality over the previous 24 hours. Does this type of data trigger any health advice or regulatory response? Yes, but only for data collected by community monitors in Port Augusta city and if the levels are above relevant criteria**. Why isn’t all increased dust levels trigger regulatory response? In Port Augusta, dust can originate from variety of sources such as moving vehicles on dirt roads, earthworks, domestic sources, wind blown natural dust or activities undertaken on former power station site. Winds (more than 28 km/kr) if blowing from the direction of former power station site may carry dust that may trigger regulatory response if the dust levels are above criteria. How can one dust average level be high when the other is low? Dust levels were high over the previous one-hour period, but have not been high overall during the last 24 hours. Dust levels were not high over the previous one-hour period, but PM levels have been high at some stage during the previous 24-hour period. 1-hour or 15-minute average data can quickly show when a dust event is happening. It can also indicate how severe it is. Dust events – 24-hour rolling average data may be used to alert residents for high dust levels or public health concerns or may trigger regulatory response. For dust (PM10 or PM2.5) AQI uses an average of the preceding 24 hours of PM10 or PM2.5 readings, divided by the 24-hour air quality criteria of 50 µg/m3 for PM10 and 25 µg/m3 for PM2.5. The table show average pollutant concentrations for the previous hour. Concentrations are displayed in μg/m3 for particles (TSP, PM10 and fine particles PM2.5). Recent air quality table displays 1-hour average pollutant concentrations for each of our monitoring sites. Data on the AQI page is updated hourly at half past the hour, so air quality for the period 8 am to 9 am will be shown at 9.30 am. In order to get an overall air quality, the index for each pollutant is calculated. The maximum of these figures is taken to be the index for that monitoring station. A standard beta attenuation monitor or BAM automatically measures and records airborne particles. This monitor works by collecting particles on a filter tape and measuring the reduction in beta rays travelling through the particles. From this, the concentration of airborne particles is calculated. E-BAM samplers operate continuously and do not need filter changes as frequently as high-volume air samplers do. This means the analysers can provide additional information, such as the time of day that peak particle concentrations occur. Used in conjunction with meteorological data, this helps identify sources of particle emissions. A metone E-sampler is a light scattering device to measure airborne particulate for operational process controls. A high volume air sampler or HVAS is used to collect TSP samples. It draws a large known volume of air through a pre-weighed filter for 24 hours. the sampler filter traps the TSP particles as air passes through the instrument. After sampling, the filter is re-weighed and the difference in filter weight is the collected particulate matter mass. Dividing the mass by the volume of air sampled gives the concentration of particles (dust). TEOM (Tapered Element Oscillating Microbalance) is a gravimetric instrument that draws ambient air through a filter at a constant flow rate. The instrument is continuously weighing the filter and calculating rolling 10 minute mass concentrations. TEOMs can be configured with appropriate separation devices to measure concentration of or TSP, PM10 and PM2.5. A pump draws a sample into the instrument through an inlet designed to allow only particles of the required size range to pass through. The instrument is approved by US EPA (EQPM 1090-079) and Australian Standards (3580.9.8 and 3580.9.13) for monitoring particulate matters. Flinders Power has a Community Liaison Group and provides information and updates to the community. For information visit their website or call 0419 252 760 and leave a message as this is an operations number. The EPA continues to support the Port Augusta community and can be contacted 24/7 on (08) 8204 2004 or email. In South Australia, the Environment Protection Act 1993 establishes a legislative framework for the management of site contamination. Where site contamination exists and a responsible party is identified, the EPA can enter into a voluntary site contamination assessment proposal (VSCAP) for the detailed assessment work required to inform what, if any, remediation is required. Assessment of site contamination is normally undertaken by site contamination consultants and in complex situations is reviewed by an independent EPA-accredited site contamination auditor, who produces a final audit report. Only suitably qualified and experienced persons undertake assessment and remediation. At privatisation, an assessment of contamination was undertaken and known to the SA Government and the power station operator. Flinders Power has accepted the responsibility for undertaking further assessment and remediation of the site and in September 2016 entered into a voluntary site contamination assessment proposal (VSCAP) defining the necessary site contamination assessment works. In March 2018 Flinders Powered renewed its VSCAP as wells as entering into a Voluntary Site Remediation Proposal (VSRP). The purpose is to ensure all necessary remediation works are fully carried out as necessary. An EPA-accredited site contamination auditor engaged by Flinders Power, has commenced an audit of the site to determine the nature and extent of any contamination at the site (this includes soil, groundwater and surface water). The auditor will also determine the remediation measures necessary to ensure the land used in power station operation (including the ash dam) is fit for purpose and poses minimal threat of ongoing or future harm to the environment or human health. As part of the further assessment work at the power station site, a number of groundwater monitoring wells were installed around the site including the ash pond, coal-loading areas and railway line. More than 700 groundwater monitoring wells are located within the site and in Port Augusta to the north. More than 2,000 soil and water samples have been taken to date. A site history, informed by all existing reports of assessment work undertaken at the site, identified two locations south of the site where asbestos may have been buried in the past (during 1950–70s). An intrusive assessment of these areas (using cut pits and trenches) in 2016 did not however identify any asbestos. An accredited site contamination auditor has undertaken a review of the Detailed Site Investigation report* which was submitted to the EPA on 28 February 2017. After completing the review and being satisfied with its content, the auditor provided an endorsement letter to the EPA. The final site contamination audit report will include a determination of the nature and extent of any site contamination present or remaining on or below the surface of the site and what remediation is or remains necessary for a specified use or range of uses. While it is likely the report will be completed at the end of 2018 and beginning of 2019, the timing of its delivery is dependent upon the auditor being satisfied that the above conditions have been met. * Please email us if you wish to view the appendices. For health advice, please visit the SA Health Dust and your health. SA Health has set up a hotline for residents with health concerns or questions. For health related information and advice, please tel: (08) 8226 7100. The EPA has been working closely with public health experts in SA Health to ensure that any potential health impacts are identified. The EPA sent its monitoring data and samples to an accredited laboratory and provided the results to SA Health. Samples of dust from the ash dam (November 2016) were analysed, to confirm the elemental composition of the dust. The raw data received from the lab was used to convert to a concentration. While any dust is potentially harmful to health and is treated seriously by the EPA, SA Health advised that ‘the ash dam airborne dust contains minimal toxic metals and substances’ and ‘concentrations of the metallic fractions in the samples were mostly at the nanogram and microgram level. The levels for many metals are consistent with normal background levels elsewhere. Concern is in the exposure to overall dust levels of particles sized smaller than 10 μm in diameter (PM10). The particles are considered to reach into the respiratory system, where they can elicit cardiopulmonary health effects, it is important to keep dust exposure to a minimum. This is relevant for short- and long-term exposure'. Letter to The Guardian editor clarifying that 'coal ash dust was not 'blowing across Port Augusta' for 2 years. This is in response to an article in The Guardian, Dirty coal: health fears of a town covered in dust from disused power station. Greenpeace Australia released a report on the Port Augusta power stations site. The Ash Dam Rehabilitation Plan is another requirement of the Closure and Post Closure Plan, as well as the EPO. A revised version was provided to the EPA, and has been assessed by the Department of Environment, Water and Natural Resources and the Native Vegetation Council to ensure it is successful in the long term. Revised versions are assessed by the EPA prior to approval. The Ash Dam Rehabilitation Plan was approved by the EPA in March 2017, subject to revision of some conditions and Native Vegetation Council approval. Dust particles themselves may cause health effects irrespective of their elemental make-up and as such the EPA remains committed to working closely with Flinders Power to minimise dust events. For health-related information and advice, please contact SA Health on tel: (08) 8226 7100. If you would like further information or would like to make a report to the EPA about a dust incident please contact us on 8204 2004 or by email. If you have detailed information to provide then we will send you a copy of the self-administered interview template for completion.